We were initially drawn to this activity gym because if the adorable owls. Our son’s room is decorated in cute owls. The styling and colors used for this activity gym is soooo much better than others I’ve seen. The quality is also very, very good! It offers some bright colors but is overall subtle and relaxing so as not to overstimulate baby with too much busy-ness. The hanging toys are wonderful! They are all adorable and they each offer baby different sounds and feelings to explore, play, and learn. We started using this for tummy time ever since he was very little. As he’s grown, we’ve seen the activity gym almost come to life at each new milestone. This is incredibly great for baby’s hand/eye coordination development. First, he noticed the toys. Then, he wanted to interact with them. When he first started learning how to use his hands, it was something that took lots and lots of practice. He began clumsily batting around at the toys. When they made a noise, it offered him positive reinforcement. Then, about a week later, he would focus on one specific toy. Then, he would slowly move both of his hands toward the toy and touch it in slow motion. A few days after that, we’d hear him batting the toys on purpose. He was able to get them each time instead of by chance! Now, he’s 4 months old and his new thing is to grab two toys at once while using his feet to get a third toy. The concentration and coordination he’s able to use to do three things at once at his age is amazing! I think this activity gym has provided him the perfect developmental support he needed to learn how to use his hands and learn to kick things. He has so much fun just laying and playing with the birds, grabbing their wings, and kicking his feet up into the air over his head. Because of the practice he’s had playing with this activity mat, he’s already able to transfer objects completely from one hand to another–very early for his age! It was amazing to see him go from noticing his hands, to trying to use them, to where he’s at now in such a short period of time! Proof that this activity gym is very important for baby’s developmental needs. While there are many activity gyms that play sounds and music, we actually like that this one does not. This way, there are no unnecessary distractions or over-stimulation. Baby can just focus on learning to use his hands and improve his hand/eye coordination. However, after about 3.5 months, we discovered that the bird with the ring at the bottom makes a “Tweet” noise when you squeeze it! All of the toys are easily adjustable and interchangeable. Each provides different sensory activities for baby to enjoy (looking in the mirror, feeling the soft crackle wings, teething ring, sounds when they are shaken or squeezed, etc.). Sometimes we’ll unhook one to let him hold it and play with it up close. 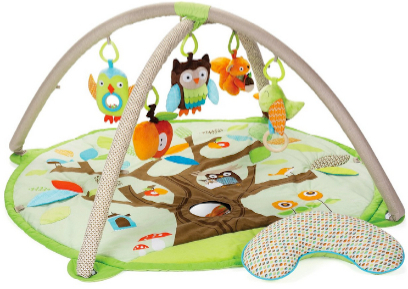 This is super easy to assemble and the mat is machine washable, which is very important for this stage in our baby’s life when he’s constantly drooling and spitting up. We are planning a holiday trip next week, and will definitely be packing this activity gym into our suitcase! He enjoys playtime with this every day, so it’s become an important part of his routine. We’ve begun putting it inside his play yard to get him used to being in there. He just loves it! Bonus: The included tummy time pillow was also great for us to use to prop him up in his infant snuggle nest when he wanted to take a nap laying on his side. Our little guy loves this as much as we love watching him play! I highly recommend this activity mat for your baby, too! Next post Andrew’s First Haircut!